The music of C. P. First has been praised by critics around the world as "dizzyingly seductive" (Chicago Sun-Times), "concise and forceful" (Philadelphia Inquirer ), "real beauty" (Vienna Times, Austria), "masterpieces" (Respublika, Lithuania), and "astonishingly complex and virtuosic" (Seen and Heard, London). Born in Harrisburg, Pennsylvania (1960), First pursued composition studies in Chicago where he studied with Jack C. Goode, Stephen Syverud, Alan Stout, and at the University of Chicago with Pulitzer -Prize-winning composer, Shulamit Ran. He then earned a doctorate degree in composition from Northwestern University. 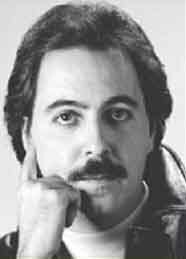 His compositions have garnered numerous prizes, awards, and honors including winner in the American ISCM National Composers Competition, winner of the Concurso Internacional Composicion de Musical Spain (String Quartet), the Fourth Annual International Spectri Sonori Competition (finalist), first prize in the 12th Annual National Association of Composers, U.S.A. Competition, the American Composers Forum Sonic Circuits Competition (1998 and 2000), three National Foundation for Advancement in the Arts Awards, ASCAP Standard Awards for ten consecutive years, ASCAP Young Composers Awards, first prize in the ACM Orchestra Composition Competition of Chicago, first prize in the Padrone-Kantscheidt Competition, first prize in the William T. Faricy competition, the Alabama State Council on the Arts Composition Fellowship, and the National Symphony Orchestra Commissioning Competition (finalist). His music is published by MMB Music Inc., Apoll Editions Austria, European American Music Distributors, Freeland Press, and the NACUSA Graphics Series. His works are recorded on the Capstone and Apoll labels. He has received commissions from the Lark Quartet, the Vienna Saxophone Quartet, Dimitris Marinos and Commissioning Music /USA, Paul Bowman for the Darmstadt Tage fur Neue Musik 2000 Festival, the University of Chicago Chamber Orchestra, the CrossSound New Music Festival, Raimundas Katilus, MTNA Commissioning Award, Christine Rutledge and Boyd Jones, Kurt Fowler, and Davis Brooks of the New York Chamber Symphony and Mostly Mozart Festival Orchestra at Lincoln Center. His biography is published in Who's Who in America and the International Who's Who in Music-Cambridge, England. Northwestern University cites C. P. First as one of five "Distinguished Alumni" in composition. In 1998, he was one of three nominees for the distinguished Cal/Alpert Award in Music.